..and why should they care? If you aren’t clear on this, your sales efforts will be severely limited. This book will help you answer these questions and more. Do you struggle to answer the “what do you do?” question? Is your business the “one stop shop” for what you do? Do you have a high “bounce rate” from your website traffic? Most businesses know what they do, but they can’t communicate it in an effective way. If you can’t communicate what you do clearly, then every sales conversation will be uphill. Poor communication of the benefits of your product or service. It’s been written for salespeople and businesses who don’t want jargon and diagrams, they want a straight talking practical way to better communicate what they do and sell more as a result. A sales message is how you communicate the value of your products or services to your clients. It’s not just a tagline or a cool name, its the tone and wording of every communication your business makes. Quite simply because if your clients don’t understand how your products or services will benefit them. They won’t buy them. How do you know if your sales message is clear? By default, every business has a sales message – a way of explaining what they do. The reality is that few of them are as effective as they could be. How do you know if yours is clear enough? Any or all of these are red flags that your sales message may need attention. Above all else, a Clear Sales Message will help increase your sales and conversion. Confidence – The confidence to present your products and services. Never again will you fear the “what do you do?” question. Clarity – You will spend less time talking to potential clients who are not a good fit for your products and services and more time engaging relevant clients and meeting their needs. Connection – You will find more appropriate clients when you are able to clearly communicate your offering. Conversion – You will convert more potential clients as they will be engaged in your sales message and ready to satisfy their needs. Question 3: Why should I choose you? Question 5: How will I know I need you? Question 6: How will I remember you? Question 7: How will I describe you to others? 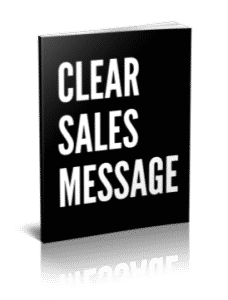 Clear Sales Message will help you to increase your sales by communicating clearly what you do and why potential clients should choose you. You can’t explain what you or your business does in a succinct way. You struggle to answer the “what do you do?” question when meeting new contacts. You struggle to answer the “why should we choose you?” question with potential clients. You lack confidence when “pitching” or making cold calls. You want to create a clear and succinct message to describe what you do. You want to increase your sales conversions. A general lack of confidence when speaking about your business, product or service. A high website traffic bounce rate. Never fear the “what do you do?” question again. Never fear the “why should we choose you?” question again. Stop being a “one stop shop”, stop the high bounce rates and stop the confusion. It’s time for clarity, confidence, connection and conversion to prevail. It’s time for a Clear Sales Message.